I don’t see any downside to managing for the worst-case scenario and that’s what I’m starting to do, prepare the business to be able to weather different scenarios. If we do get a more variable climate, if it is going to be slightly warmer, if we are going to get more extremes or longer dry spells and then the rain’s going to come in heavier events, I think: How can I set myself up for that? My family has been in the Deniliquin/Conargo area for 100 years now. In 1912, my great grandfather was based around Griffith, and he came down to the Conargo area and leased a property from a station owner. It was all sheep-grazing country then. We’ve still got that original property at Conargo plus another area of land nearby, which my Dad purchased when he was around 30. This was the foot in the door to get some irrigation country to take a bit of the climate risk out. In 2008, Dad and I started working together and bought another property at Deniliquin. My parents and I did our succession plan early and now my wife Hayley and I have bought out two of their farms, which has been fantastic. Our two little boys, Alby (3) and Oscar (18 months), are the fifth generation of our family to live here. But in 2008, the area was still coming out of a drought. We were lucky that we had underground water security, so our business was able to still grow rice and grow pastures for our livestock. The Murray-Darling Basin Authority had been established, and they were looking to implement their plan. So the first two years of being home were quite tough, but in our business we could make change because we were prepared for this in a sense. Conargo is just north of Deniliquin, which is in southern New South Wales in the Riverina area. It’s quite a dry, flat open area, predominantly sheep-grazing country. 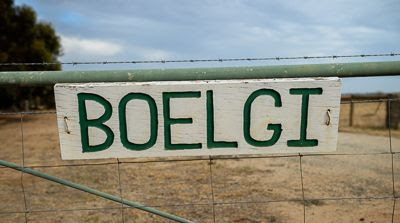 We have about 2500 hectares across two properties in this region, and 50 per cent of that is irrigated country. Rice is the number one crop that I grow. It’s been grown in the area for over 50 years, and my family’s been growing rice for about 45 years. Terraced rice paddies are what everyone thinks of when they think of rice, but we’re completely different. We’re growing it in flat, open country – the flattest plains of the world. 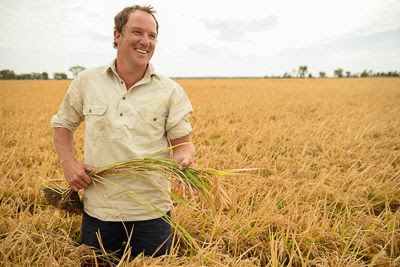 Rice makes up 50 per cent of the income for the business, and the balance would be 40 per cent livestock and about 10 per cent, give or take, for winter cropping. With the winter cropping, I do a little bit of dryland farming but, given the rainfall, it’s hit and miss, and very much opportunistic. I also grow winter crops on irrigation, on raised beds, as well as putting some crops into the moisture once a rice crop has been harvested. I’ve got about 1000 mixed ewes at the moment: merinos and some crossbred ewes. The grazing for the livestock is native grasses on quite pastoral country. 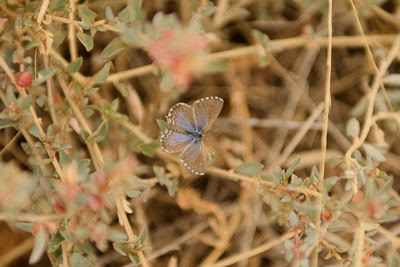 We have low rainfall, approximately 14 inches, or 350 mm a year. It’s very variable from year to year. In 2008, for example, we had around 200 mm and then in the next year we had 600 mm. The following year we had 500 mm and it’s been slowly going down each year since. It’s not a secure, constant rainfall area. We get extremes at both ends of the scale. We can get massive monsoonal rains like when Cyclone Yasi came through in 2011 and broke all the records for daily rainfall. We also get the fronts that come out of the Great Australian Bight. So we get extreme rainfall, extreme heat and extreme cold. It’s the same with temperature. In summer we can get up to 46 degrees, very hot. And then we can get down to minus 4 in winter. So it’s almost a desert-style climate. I see that all parts of the climate generally go hand in hand. Say, if it’s a drier season, frost becomes more of a risk. With winter cereals, if they’re moisture-stressed they’re far more prone to frost. And an El Niño year, as we have just experienced, generally leads to drier, cooler times, so we can get a lot more exposure to frost risk. I find seasonal forecasting a pretty interesting space, and that’s a major reason I wanted to get involved in the Climate Champion program. I want to understand how seasonal forecasts, or forecasting in general, are done and what the variabilities are, because I rely heavily on the Bureau of Meteorology’s seasonal forecasting. If they’re predicting dry seasons I think it can be quite accurate. But predicting an above average year, I can’t bank on that and say, “Okay, that means the water price is going to be X, or my water allocation is going to be X”. The seasonal forecast is designed to be a guide, and that’s how I use it. With a weekly, monthly or seasonal forecast, it’s too much of a risk to say, “Well, they said it’s going to be a wet autumn so I won’t water my pasture”. Because whether it’s waiting on a 2- or 3-month window for rain to come, or a 7- to 14-day window, that’s where you lose a lot more money than taking action with what’s in front of you right now. But the variability between average and above average, and well above average, for me and my business, is significant. That’s where seasonal forecasts are so important. They provide the link to all my other decisions about managing climate risk. If we could get to a 2- to 4-week accurate forecast, that is where it would have huge benefits for agriculture in Australia. They are real decision-making tools, especially 2-week forecasting. The accuracy of 3- to 4-day forecasting, we’re there now; it’s also pretty solid for 7-10 days. But 10-14 days is where we’re really failing. Every farmer is ringing almost every morning or night to decide what they’re going to do next week or over the next 3-4 days. We have our overall plan, but if we could see a significant rainfall event coming in 2 weeks’ time and it had some sort of accuracy, you would modify your plan. You’d push that bit back and you’d bring this bit forward. That’s where I’d love to see us get to: 14 days plus. Because of the low rainfall here, irrigation is important to our area and to my business, to manage variability in the seasons. Our irrigation is fed from around Albury in the mountains of the Great Dividing Range, and we expect the rainfall there to be a lot more secure. The water comes from the Murray Irrigation Scheme and is delivered almost to your doorstep. We have a metered outlet, which the irrigation company controls to give us the water that we’ve ordered. My whole farming practice is gravity-fed. The paddocks are laser-levelled so we get even water distribution, and then it just gravity feeds down through different bays and waters the pasture as it goes. We also have underground water on one property. For many years, my father had toyed with the idea of diversifying into some higher rainfall area to try and take a bit of the risk out of the business. 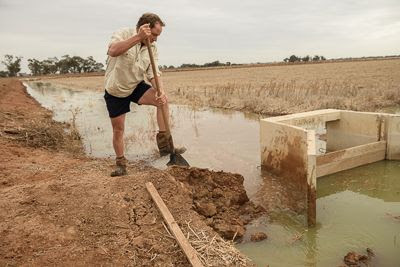 Obviously, going from dryland farming into irrigation took a lot of the risk out, but then, as the years have gone on, the variability in water allocation has also exposed its own risk and there is significant capital outlay with investing in water. In 2012, I took on the opportunity to do some share farming and leasing of property around the Nagambie area in Victoria. That was in the bid to try and buffer some variability in the business. So my business is in two locations, but there are three farms. The farm at Conargo is pastoral country, sheep country; it has irrigation water and secure underground water, which is pumped from bores. That is the most secure water I have in my business. The Deniliquin farm has the river water entitlements, and that is very variable. And the Nagambie farm is the higher rainfall cropping and grazing enterprise. So the idea is that all three will not all have a bad year at once. But in 2015, I found out that it is possible. I remember being with the bank manager as I signed my life away and took on a significant amount of debt, and we had a 6-month-old child, and the bank manager said, “Let’s just hope you don’t have a bad year in year one”. And we had the triple whammy in year one. At Conargo one of the boreholes collapsed, so we had to get a new hole drilled, which is a huge cost. Then, on 1 September, we had a heatwave with horrendous winds that came through the area. The spread on my farming locations is 300 kilometres from the northern one to the southern one, and they all were impacted significantly by that wind. The Conargo farm had the yield reduction from lack of water plus the wind damage. At Deniliquin, we had the heat damage, and there was no rainfall in the catchment area so there was no irrigation water. And the dryland crops were severely impacted by the heat. 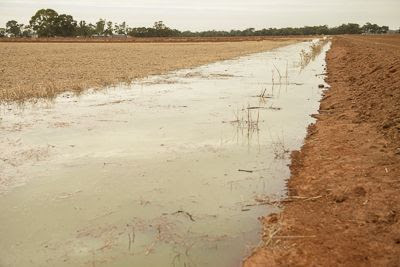 And Nagambie, which is pegged as one of the most secure rainfall areas probably in south-east Australia, had its lowest rainfall on record, and it also got hit by the heatwave. I had 30-40 per cent yield loss on all of my crops across the three farms. It was a tough few months. So now I’ve completely restructured my business to reduce the amount of risk, because there’s absolutely nothing to say that that won’t happen again this year. It was a good wake-up call for me to realise that I really need to reduce my risk. And it also leads on to why I got involved in the Climate Champion program [late 2015], because I’m interested in any tools or any ability to get information that helps my business, and I want to be able to pass that on to my industry as well. There is variability happening and it probably is becoming more extreme. I’ve enjoyed some good conversations around climate with people who have lived in this area for 60, 80, 100 years. And there’s nothing that they haven’t seen before. It’s the frequency of it that is probably shifting a bit. Locally, the variability is coming from competition for water as well. I find it pretty exciting to manage for variability, because it’s a much more comfortable position to be in if you can say, “Okay, well if this does happen, this is what we’ll do”, as opposed to sticking your head in the sand. If there’s only 10-15 mm forecast, what are you going to do if we only get 5 mm? I’m far more relaxed now. Because, with any business, making it much more resilient comes into your employees, into your family, into everything. We’re lucky we can buy water now and have it delivered to our farm if we don’t have any in our water portfolio. I’m able to buy water from the Murrumbidgee system, and anywhere along the Murray system. Buying water on the temporary market also has a capital outlay, but it’s not as big an outlay upfront as buying a permanent entitlement; it’s more of a variable cost year on year. And you secure the water: when you buy 1 megalitre you get 1 megalitre, whereas when you buy an entitlement you might only get 23 per cent of that 1 megalitre, like this year. Right now it’s 6 April , and I’ve got ewes that are about to lamb. This season we have only had about 50 mm of rain, so we don’t have any green feed. And April is usually our driest month here. We have a low allocation this year, but I’m in a fantastic position because I can actually buy water and irrigate some pasture for them to lamb down on, even though it is expensive. The current water market price is $230 a megalitre. What we called a high price 5 years ago was $30-$40 a megalitre. What we call high now is $100, and here I am paying $230 a megalitre to water pasture for my sheep. But commodity prices are there. The sheep market and lamb market are strong. And I’d much rather utilise the ability of irrigation to put myself and my business in a position to take advantage of a good market. In a dryland area, I’d be at the mercy of the weather 100 per cent, and I’d be forced to sell my sheep. And that is what’s happening now: people have held their sheep, fed them, watered them, looked after them, hoping that it’s going to rain, and there’s no green feed around and they’ll be in a position where they have to sell. They’ve already spent their money, and they’ll be selling at a lower price, unfortunately. So to have irrigation and to be able to grow feed at the right time and then, hopefully, expose my business to an upside as opposed to a downside is something that I’m really working on now. Rice has been grown in Australia since 1917, but it wasn’t until the 1970s that rice really took off in this area. Dad is the first generation in my family to grow rice. The rice we grow in Australia doesn’t compete with the Asian countries. Thailand, China and Indonesia are the biggest producers, but they won’t trade anything. 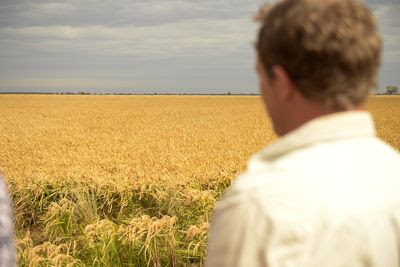 Of the 600 million tonnes of rice grown in the world, only around 20 million tonnes are traded, and of that Australia produces a million tonnes. So we have a huge role to play in the world rice market. Generally, it’s an October to April growing season. 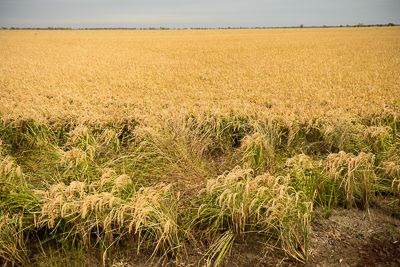 We plant rice on 1 October; March is our ripening window; and the last week in March and most of April is the harvest window. 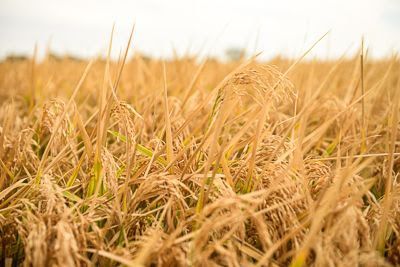 The R&D side of the rice industry is doing everything it can to develop shorter-season varieties to push the planting window later but maintain that same ripening and harvesting window. Sowing later would give the rice the best chance of getting into mild temperatures for that grain to be ripening. If it ripens too fast it’ll crack, and selling broken rice isn’t very profitable. So we want as many whole grains as we can, and that softer finish is what allows the plant to physically mature as opposed to being forcefully matured by heat, which can happen in February. The shorter season also means we use less irrigation water. Rice can get frosted, same as wheat. In January when the plant is about to start flowering, if night-time temperatures drop below 15 degrees it can get quite badly frosted, and frost has the same sterility effect as it does on wheat – it’ll abort the flower and abort that grain. R&D work is trying to get that cold risk window reduced. It’s usually late January, but in the last five years we’ve seen that window shifting more into February. With irrigated winter cropping, frost risk isn’t major because the plants aren’t water stressed and they can transpire moisture and cool the micro-climate around them. Rice is not only at risk from cold overnight temperatures – we also have heat risk. 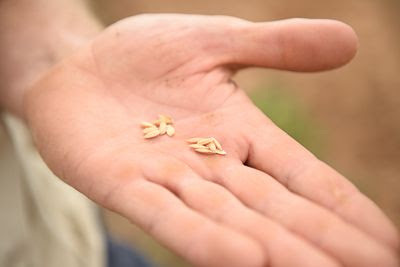 When rice is through flowering and grain fill and trying to form the grain, the quality of the grain can be significantly affected by extreme heat. We had 10-12 days of extreme heat starting in the first week of March when the grain was trying to fill, and that can affect the quality. We’re noticing that we are getting more heatwaves and probably more variability in the minimum temperatures. We have very heavy clays, and that’s why this area is a major rice-growing area. The heavy clay sets hard when it’s wet, so the water-holding or sealing capacity of our soils, while not ideal for other crops, is perfect for rice. Under government legislation, if you want to grow rice you have to have a minimum of 3 metres of clay in your soil. That’s to stop any water or chemicals from leaching down into the underground aquifers. 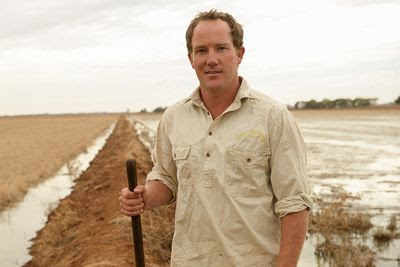 And that’s why rice is only grown in the Riverina, because the soils that you require to actually legally grow rice aren’t spread out through other irrigation areas. With the clay soil, under irrigation the whole soil profile will be full and it’ll stay full. Generally, we have red and black plain soils and not much loam. The fertility of our soils is very good, but they are quite sodic, meaning that they’re very dispersive and hard-setting. I’m moving to furrow irrigation, which allows the water to go in underneath the soil through the cracks that naturally form. The water will fill the soil bucket from the bottom up, as opposed to flat irrigation, which fills the soil from the top down. Furrow irrigation allows the soil structure to hold together much better and will build organic levels, reduce the sodicity of the soil, and hopefully allow it to be less hard-setting. We should have much more water-holding capacity and nutrient availability as well. One of the big changes I’m implementing this year is a fallow phase on the cropping areas. Instead of planting 90 or 100 per cent of the area each year, for everything except rice I’ll plant up only 70 per cent. It’s mainly to manage water throughout the next season. The rain that’ll fall over this winter will go into the soil and be stored in my bucket. And I will almost guarantee a 30 per cent area that will produce a good crop for next year. And it’ll be a much lower cost crop: it’ll have less chemicals for weed control, the soil structure will improve from not having had a crop in that year, and it has the underground stored moisture. A lot of people won’t go down the fallow path, because they feel that they can’t afford to have that much of the land sitting out for 12 months. But I’ve already done it and now I’ve got 30 per cent of my land that I know is ready to go and I can plant it almost at any time. It’s the most satisfying thing I’ve done for a long time. In the irrigation areas I use soil moisture probes for scheduling of water. When the water capacity in the soil has got to a certain level, I’ll say, “Righto, in the next 5 days we’ll start watering these fields”. In the dryland areas or in the fallow phase, whatever rain falls is there in the soil but we can control it by reducing how much vegetation grows on it. By grazing or spraying, we’ll be able to reduce how much water is taken out of the soil over that period. We walk out and dig a hole, see where the moisture’s up to and make a decision from there. Australia has the most efficient rice growers in the world. When it comes to water use, compared to grain, we by far produce the most tonnes for the amount of water that we use, and we have done that since the 1990s. At the moment we’re on about one to one: 1 tonne for 1 megalitre of water. We get 10-12 tonnes of rice per hectare, which has increased from about 9 tonnes per hectare 10 years ago. So as an industry, we’ve reduced our water use and increased our yield per hectare. And we’d love to see it get to 13 tonnes of rice from 9 megalitres of water. That’d be the optimum to really get the water-use efficiency up. And the R&D is 100 per cent focused on that, and that R&D is exactly why we’ve had the ability to get to where we are now. Being in the most arid climate, we’re only still farming here today because of R&D, especially for growing rice. And it will need to be continued well and truly into the future. I’ve been involved in the Ricegrowers’ Association for 7 years now, and I’m currently the Junior Vice President. It’s a fantastic organisation to be involved in. They’re very big on development of young people for the industry, because it is a small industry with just 1200 growers. In an irrigation system there will always be some tail water that comes off the fields, and if you have a rain event after you’ve irrigated, water will potentially run off. We are recycling all the run off water. We’ve got gravity-fed drainage systems that go to one low point, and that water is then pumped up into a storage dam, or we can pump it back up into the top of the supply system to reuse it throughout the fields that day. So no water leaves my irrigation farm. Any water that comes on the farm is used for production, because at $230 a megalitre, you don’t really want it to go down [the drain]. Nothing underpins our business more than water. So if we can have more permanent water at the right price, it will be a great business decision. A few years ago when we looked at permanent water entitlements we thought it was underpriced, and hindsight has shown that it was very cheap; the value of that asset has gone up significantly in the past two years. I think sometimes we can get too focused on the price, the upfront cost, and we don’t focus enough on the potential downside risk. We see the price is too high, the forecast is saying there’s rain coming in 10 or 14 days, we’ll just wait and see what happens. We wait, the rain doesn’t come, the water price goes higher. The crop’s stressed and then you’re using very expensive water on a crop where damage has already been done. So I’m focusing more now on the downside risk as opposed to the upfront cost. And in dryland farming, one area that I’m looking at more and more is reducing the cost base significantly to try and bring the cost of production down instead of focusing so much on the potential upside. With my experience of 2015, I realise now that I was far too cocky that we weren’t going to have a bad year. If the season does go pear-shaped, managing the risk is going to have more of an impact on my business than if I get an extra half tonne or tonne yield. That’s probably the biggest lesson I’ve learned in a very short time. I feel as an industry we’ve become too production-focused and we’ve moved away from being profit-focused. I think that by pushing the production, we’re increasing our risk exposure. So I’ve moved away from that and found an advisory group that fits my vision of what I want for the business, which is having a resilient business that can withstand anything that’s thrown at me, as best as I can. That is their number one focus: reducing the risk and bringing the break-even cost of production down, so that if there is a lower rainfall year or if there are some other adverse conditions, we can reduce the impacts and focus on profit as opposed to production.